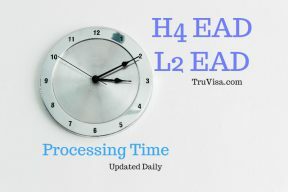 H4 EAD, L2 EAD, i485 EAD – Employment Authorization Document for H4 dependent, L2 Dependent and Green Card i485 EAD. USCIS EAD processing time varies between 1 month to 6 months. H4 EAD, i485 pending EAD RFE takes 60-90 days. Start working with EAD card. SSN 4-6 weeks. Can I apply first H4 EAD along with my H1 extension? Can we still be able to operate business if H4 EAD goes away? Hi Anil, My wife who is on H4 EAD have been running business for 6 months and we have invested quite a lot into it. What if this is revoked then how should we go about the business, can we still be able to operate it. Any advice. Is Biometrics needed for H4-EAD? Continue Freelancing Work after H4 EAD expire and Take payment After renewal? Processing time for i485 EAD card after fingerprinting?